Let me compliment you, once again for the great service you doing to Minerals faternity; You made it a global hub and giving your frank opinions. Keep doing this and I as a Mineral Engn I have no words to compliment your service . The other day I was talking to Dr.Alban Lynch,my mentor and teacher, and he is also full of appreciation of your services to Mineral Engn. Many thanks again TC. Please give my best regards to Alban next time you speak to him. Waset Paris June 20-21, FAKE Waset conference....BEWARE! It is very good of you to point out the issue. There are plenty of links warning about WASET (a simple Google search- WASET/scam). I am very sorry for those who have had their money stolen; and it is a shame the authorities are near-useless at overcoming international scammers. Thank you Barry for taking the time to expose this WASET conference for what it is. I make it a point to only consider Conferences associated with well known organizations like CIM, SME, etc.to which I belong as a member. I have really appreciated your blog about the WASET conferences. By the end of 2011 I got really interested in one conference that took place (or not?) one year ago at a very exotic (and thus attractive, not in the sense of Venice, but more adventurous) place, Ulan-Ude, Russia. But then the web site (http://www.epsglobal.ca/Meeting_en/new_en/20111027/403.html#) was very incomplete, the organizing company from another area, and the registration expensive (US$ 1200), and I gave it up because it looked too dangerously to be a scam. I still don't know if it was a scam or actually a good conference, but today the organizer's web site looks as it has not been updated for at least one year. It is annoying to think that we could fall for it, but is very good to be aware. There are some replies on this blog from people who have attended WASET conferences: http://comp-lite.blogspot.co.uk/2010/07/is-waset-fraud-whose-victims-keep-quiet.html. It makes for interesting reading! please, how did you cancel and withdraw your paper. i intend to do same to mine. there is no email address with which to contact them, only the contact section in their website. is that contact section OK to do the job? thank you. Have you successfully widthraw your paper? It is a warning to young researches who are anxious to attend conferences and present their work. i have followed the WASET website for the last two years and got suspicious about the conferences. Is it possible to organise conferences on more than 10 areas simultaneously in the same hotel? Later,in one of the blogs ,I read the experiences of a scholar who attended the conference. I think there is a need to expose the activities of WASET .Hope more people will share their experiences and expose WASET conference activities. It's interesting that the organisers have nothing to say in their defence, even though I brought this blog to their attention over 2 weeks ago. I have also attended a WASET conference in Dubai and got the idea quickly. If your paper is worthy DO NOT waste it by publishing it on WASET journals. They are not professional journals neither the conferences have anything to do with science. Anyone can publish anything in WASET. No reviews... When I sent an article for publication, it has been accepted the next day without any comments!!! SO if you want just to publish... WASET may help you but if you are a researcher with a worthy background and a professional, just don't look at WASET. did any one attend the conference anywhere? I have a conference at Paris on dec 30-31 2013. I am hesitant to pay and travel and then find nothing over there. did u actually go to the conference? A few people here have commented that they have attended WASET conferences, see Christos's comment above and Hector's below. It seems that the conferences DO run, but that they are very low quality and include a lot of papers which are of no relevance to your subject. Hello, I have a Waset conference in Istanbul on 17-18 February, and I'm hesitant, because I doubt that it is a scam, the problem that the members of Waset gives us an address of hotel saying that this event will take place there, whereas members of the hotel say that this is not the case! Last year I attended a WASET conference in London, it surprised me how fast I got my paper accepted but I wasn´t suspecting any fraud, however, when I attend the conference I was very disapointed, I arrive on time for registration and there was only one person starting to unpack some materials for the conference (there wasn´t any signal regarding the conference in the hotel), when the conferences started I was very surprised as they were about a wide range of topics (suposedly the conference was about sustainable agriculture), all in all it was a very unpleaseant experience for me as it was only the second time I presented a paper in an international conference and I put a lot of effort (and money) on it. It's very interesting to read of your experiences, Hector, Christos and Anon. The more people who share their stories, the easier to is for the rest of us to learn and not make the same mistakes. Thank you. I sent a paper to WASET in 2011, which they published in issue 80 of the year. However, I cannot locate the article again in their website presently. It is amazing because I did not pay a dime for the publication. Could it be a scam? The conference did go on but it is definitely of low quality. There were only 4 papers submitted for the conference that I registered for and only 2 presenters turned up. The conference hotel was also changed at the last minute. The administrator for the conference was also dubious. He claimed that he is a professor but refused to provide any name cards or official email address. Oh no, that's sounds awful. Thanks for coming back and sharing this with us and I'm so sorry to hear that your hard work was not rewarded by attending a good conference. I humbly request everyone not to send any papers to WASET. It is the only conference, where certificate of participation will be issued at the time of registration itself on the first day. Do not waste your money, time and valuable reserch work. I am also one of those who felt chearted by WASET. they are definitely low quality confrences, poor organization, conference rooms packed - they are small. In Paris in June we had to walk across the street to get our lunch as s result all the afternoon sessions were late and poorly attended. they are only good for academic tourists! We register for a waset conference, but until the last minute, they send us an email to say that they have not revieve our registration fees. I contact the hotel where the conference must take place they say that they have not informations about this event. We was confused and decide to give up. It's an adventure to go to a country and you are not sure that the conference will take place or not. Thanks Adam, I just read your blog and it seems like you had a lucky escape. The program was bizarre, particularly the paper from the Football Training Centre in Nigeria - very relevant to a conference on Sustainable and Renewable Energy Engineering... not! I have been wondering if WASET is a real thing. I was looking at the Chemical and Material Engineering conference however got a bit confuse why there are many similar conference in each year in different countries. I am so glad to read this comment. Thanks so much for exposing the scam. Does anyone know how I could remove my paper from the WASET website? should i contact them telling them i will not attend? I would contact them and ask them to remove your paper, although I wouldn't be surprised if you don't hear back! I just posted elsewhere in the blogosphere re: my concerns that this very morning I was told by WASET that I am NOT presenting afterall at the May 16/17 "conference" in Amsterdam for "International Nursing Informatics Conference" which didn't feel right from the start. My three papers were accepted very quickly, if memory serves, not enough time elapsed to give it a proper review. I only learned this this very morning (Saturday April 26th) and despite what I and the credit card company say--there WAS clearance/authorization to charge the very expensive meeting registration to my credit card (about $900 U. S. money), WASET says I am not registered so cannot present. Upset earlier today that my time and effort and hopes were invested, I seem to be quickly changing to disappointment that I was 'taken' mixed with gratitude that it isn't too late for me to cut some losses on the travel arrangements for this, my working vacation, cancelling Amsterdam altogether and continuing instead to use my precious time off for my attached real vacation with family in Ireland. Anyone, should I cut my losses/forgetting about Amsterdam and WASET because its' either totally fake or of poor quality? I am senior in my field of nursing administration here at home and an identified scholar with a satisfactory set of publications and scholarly work which I can continue another way-will find different homes for my publications....is this what I should do? Hi Mary Anne, I'm sorry to hear about your experience. As to what to do, if I were you, I would cut my losses, unless I particularly wanted a holiday in Amsterdam! From what others have said, even if the conference goes ahead, it would seem that the programmes are very random and I doubt it would be of much use to you professionally. Good luck and I hope you enjoy your holiday in Ireland! Have decided to continue to Amsterdam for a more pure vacation experience as the fees to make changes for flights are unreasonable. I, of course, will not be presenting (I did not pay a registration fee) but had I not figured this out two days ago (that WASET is a scam! ), I would have shown up at the appointed time and place in Amsterdam, trying to insist, if you will, that I should be allowed to present...and pay at the door...as the WASET site indicates you could. I, of course, would pay with credit card which is where the revelation seems to occur for some: that you canNOT pay by credit card at all (people would have a recourse) and the bloggers here indicate that they were taken (some anyway) by wiring money (I assume no/little recourse for the individual). It has been suggested to me that I show up at the conference to 'take names' perhaps try to register for the conference, see what happens. Maybe report to hotel management and/or local police. Trouble is, I suspect all will say no crime per se, just poor quality, questionable business practices and low integrity. I am not beyond showing up to learn ....because I will be in town and its just a cab ride away. I plan to call in the morning to engage them in discussion. I do not intend to make it my life's work to bring these people to justice; but i am motivated enough to explore writing for publication on the matter of "predatory open-access publishing" or "predatory scholarship" which are the terms I recently learned, since Saturday. Who has a suggestion for me if I go to the hotel? Talk to the 'organizer'/gather evidence? Talk to the other attendees...others on this blog indicate some of the meetings simply don't 'go' while some get moved to a different venue? I have internet access while away, I leave Friday. If I do write for publication, are my keywords ok as per just above? Sorry for the late reply, how did you get on in Amsterdam? I hope you had a nice little holiday in the end! I am in a waset conference held in Copenhagen right now. I admit that acdemically it is not a very high quality conference. In this session there are presentations in different subjects but all categorized under social sciences and humanities . I am writing to complain on the quality of the conference that I have attended recently in Istanbul. Overall for me, this was the worst conference that I have ever joined since becoming an academician. Poor management on tentative and facilities have caused a lot of problem during the program. On top of that, the participants are pooled from wide different background and being registered under different conference name. Therefore, the discussion become more general and presenters need to clarify the topics in details which not supposed to be. It is undeniable that this is the low quality profit based conference organizer and attempts to easily extract the money from the conference fees. In return, the participants attended poor quality program and being given cheap printed proceeding and pouch. I am distributing this information to all colleagues and friends to ban any program organized by WASET. I have both attended WASET one conference, submitted and published an abstract and paper there, and have reviewed several papers for them this spring. It is true that the conference was small, held in several rooms with several tracks, but the people who attended had done real work, some of it rather good, and they tended to be from countries that have historically had a difficult time publishing in western journals. I have published in "good"mainstream journals before myself also. It is a peer reviewed system, they have many of these conferences and it is possible to go and just have a vacation in an interesting place. However, for my purposes, I wanted to publish within my first year in a new place, starting from scratch, and WASET enabled me to do that. I also met junior scholars who were learning how to present and publish and who got good feedback on their work at this conference. They did feed us within the conference with hearty lunches, and at the end also took us to lunch at a decent restaurant that was NOT a chain (this conference was in NYC, which I know well from living and working there, and the restaurant was one that had an "A" from the NYC Board of Health, and, one that even though it is in a touristy part of town near Penn Station, was very acceptable) for further conversation. Our host was a long time professor in one of the local NYC universities. The persons who reviewed my abstract were polite, and persistent, and they did make comments (and I had to change the format repeatedly to get it into the online system). I realized when I went to the conference that it was because the booklet contained full papers, and you are meant to submit papers that are camera ready for review and commentary because once they are accepted they apparently go into the conference booklet, which then counts as a publication. While I will grant that WASET conferences are not like the big professional science conferences that many of you may have gone to they have a definite niche, and serve a purpose. I would not be so quick to denigrate what they do - everyone needs to start somewhere, and some people might be a bit overwhelmed going to IEEE, or AAAS, or ACSB, or any of a number of larger, professional conferences with a bit less hand holding. And, you do get your work out there - since I can remember publishing at a time when little cards from people all over the world would arrive requesting a copy of your paper (which was exciting ! But, took a long time from submission to publication) the WASETs of the world can serve a purpose that is helpful. Thank you for your input "Anonymous", it's always good to hear both sides. I wonder, do you have an email address for anyone at WASET, since you have been reviewing papers for them, that you could pass on to me (Amanda@min-eng.com) as I would be interested in bringing this blog posting to their attention so that they can comment on it. I have attended a WASET 'conference'. I believe the organisers are fraudulent in their advertising of the event. The same 'conference' is advertised under several different scientific specialities, ranging from remote sensing, to genetic and molecular engineering, business, statistics etc. so people applying to attend or present are lead to believe that the conference is in their specialist field and the audience will be a collection of their peers. What actually happens is that all these specialities are clumped into the same conference!! And you are lucky if you get even one talk on the subject of the conference you actually applied for. You are given a certificate of attendance stating that you have participated in a conference about a certain subject. This is blatantly false. I did not present. Those that did present, I thought had good quality research. However I am concerned that if state in their CV's that they have presented at a WASET conference or had their work published in the WASET journal, it could be detrimental to their careers. The organisation was well below what I have experienced in every other conference I have attended. The computer provided did not work, presentations that were sent to be downloaded to the website were not there, and the number of speakers far outweighed the time allocated for them to speak. Thank you all for bringing up the WASET "conferences"! As PhD student, I found an interesting conference coming in London, sent an abstract and got it "peer reviewed" in 3 days. The acceptance email came from waset.org -address and I became suspicious. I googled WASET, and one of the first pages I found was this blog. Thanks to you, I withdraw my abstract and send it to another conference organized by well-known international association. Hello there, thank God I googled and stumbled upon this blog. I had sent my paper to Waset Conf scheduled on feb 2015 in Kuala Lumpur Malaysia and had been accepted within a week. But was a bit confusing when I received no reviews, that is obviously weird. I was planning to go, but recently stumbled upon a list of journals and publishers that are banned from Ministry of Higher Education in my country, and Waset happens to be one of them! Then i googled and this entry confirms it. Tq. How do we withdraw our paper from the conf? Thanks everyone for sharing your experiences. DeLinn, I don't know how you withdraw a paper, I have had no success in contacting the organisers myself. Maybe just email them and tell them you are withdrawing it and then consider it withdrawn and submit it somewhere else? I attended the ICLL 2014 (language learning) in Oslo. We were lucky - the conference was held in the announced hotel (we booked accommodation in another, cheaper hotel), papers were published in the International journal of social, management, economics and business engineering - but probably this is an online journal WITHOUT ISSN or ISBN. Thanks Paolo, that's very interesting. I just attended the WASET conference today in Venice. It is a completely fake conference. There were 41 seats in a hotel room. In total fewer than 15 people attended., and the topics presented are not in the same area at all. The organisation only intends to cheat people to pay. The key issue for people who have suffered from the fake conferences is to let WASET fall. Thanks for letting us know and sorry that you had such a bad experience. 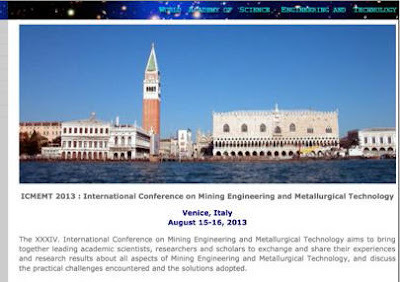 WASET announced that the conference is on 13-14 November 2014 in Venice. However, the so-called "conference" is located in Mestre, which is a sober and dirty town nearby Venice. Very dishonest and completely miss-leading! The only goal of the organisor is to cheat people, as many as possible, in order to get higher profit. WASET does not care about any content of the conference. Is there any possibility to sue WASET? I don't know about suing them, I expect it would be next to impossible to be honest. For a start you'd need to find contact details and that seems to be hard enough! I was accepted to the conference in London on January 19th-20th in 2015. I was going to pay my fee right now when I found the blog and discovered WASET is fake! I have no words to say how sorry I am. I had worked on my paper for months! Has anyone heard about the London Conference in 2015? Although my article was accepted by the Waset within 2 days after submitting, I did not pay the fee and participate in the conference, because I read this blog. Thank you very much everyone. But, I visited the venue to check the situation in Thailand on 18th - 19th December. The Waset's international conference was held at the small floor of Amari Hotel, in which there was no guide plate and flag with conference name in the hotel including the floor. Therefore it was difficult for me to find the conference hall and reception. Actually, I took some photos. This was first time for me to see the conference without any notice board in the venue. I am extremely thankful to your comments...I doubted it because of the small gap between the abstract submission and the conference itself, besides the unknown board members for the "International Journal of Civil, Structural and Architectural Engineering". The main theme is something and the previous publications is something else. Thank God I didn't waste my time for it and I'm blessed to find these comments of this mysterious WASET in the right time. I was quite thrilled to find another conference that I could possibly attend to present my research work. The website looks legit initially, but the more I read the looks, the more suspicious it looked. All the flyers and a lot of the contents are the same, except the dates, venues and name of conference. It seems they have soooooo many conferences in a year, covering so many countries! I was almost going to register already, but decided to do a quick check on google. Thank goodness I came across your blog! Im soooo glad I googled the website because I became suspicious after I went to the PAYMENT section. Obviously I became interested at attending an conference in London despite the costly registration fee. Here is the payment heading reads 'Due strict rules of froud protection of issuer bank, your payment can be rejected by no reason. If so please head to other payment methods. ' The moment I spot the spelling and grammar mishaps, I stopped. That was lucky! I'm so glad we've been able to help in this way, otherwise a lot of people could lose a lot of money. WASET conferences are completely fake. I discovered by chance that am listed as an organizer on dozens and dozens of these fake conferences all over the world. In order to be doing this I would have to be constantly traveling the globe. I had no knowledge of these conferences and yet my name and affiliation is listed on numerous scam WASET conference web sites. I have contacted other professors listed as organizers for WASET conferences who were equally unaware of the abuse of their name and institution in this manner. There does not seem to be anything we can do about it since these scam artists, crooks and scoundrels refuse to stop this activity. I have asked them to stop using my name, to no avail. I have never consented or been informed of my name and institutional affiliation being used in this manner. Beware!! WASET is a complete and utter crook and scam outfit! I've never heard of either, but a quick google found them and they look real enough to me. Please do not waste your time and money by attending WASET conference. it is just a scam. I was just attended to one of them and I am really sorry of my time and money. Me too! Just a scam conference. waste money and time. After so many years, there isn't any authorities take actions on them! There is a trending story on various news sources about a professor who used iOS auto-complete functions to write an abstract for a conference on atomic physics. It's an "accredited CPD conference," whatever that means. The abstract is hilarious! Thanks for the links Peter, I just had a read and it's absolutely incredible that such an abstract should be accepted. No one must have read it. That link lead me to this one http://cabbagesofdoom.blogspot.co.uk/2013/07/omics-group-conferences-sham-or-scam.html which details the OMICS Group conferences. They sound very similar to WASET conferences! Bit like my "technical note" on homeopathy in flotation, which was accepted after 'peer-review' within hours. Anyone with a modicum of knowledge would have realised that it was total nonsense. The frightening thing is that people are still obviously attending these events. You would think that professional people would be able to sort wheat from chaff. I think you're being a bit unfair to people actually. Why wouldn't people take a conference at face value? It's easy to say in retrospect that they should look deeper into a conference, but I know that I for one was completely unaware of these 'fake'/'scam' conferences until I noticed this Waset conference was listed on online calendars as being on 2 different dates and investigated it, leading to your blog post. I see your point, but surely if you were thinking of going to a completely unknown conference you would do at least a little research beforehand? Google maybe? I am a newbie researcher who has just finished my PhD. I have submitted an abstract to one of WASET conferences and already got an invitation to attend it. If I do not attend the conference and do not present my paper there, is it possible to submit my paper to a journal or another conference? Please be alert for the WASET conference in Kuala Lumpur, Malaysia in August 24th to 25th August, 2017. Although the Pacific Hotel is recorded as the venue on the web site. a check with the Manager of the hotel indicated no contact has been made by the WASET organisers. On sending the manager's reply to WASET, the usual quick reply has been met with no response. I am a newbie as well, Can Rupawan's case apply to myself? 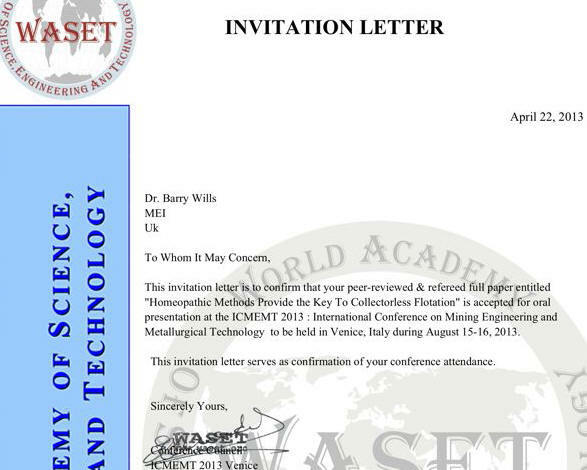 I have submitted my FULL PAPER to a WASET conference and got an invitation to attend. If i do not pay for registration, do not attend the conference to present the paper, can i publish with another journal or conference? Although i have just sent them a query through their website on my decision to cancel and withdraw my paper. Does anyone have an email address through which to reach them? I attended the WASET conference in London on One Health, 25-26 May 2017. It did take place & there were other participants (although many scheduled to present did not show). Note that although it was a two day conference, the presentations were all scheduled for the morning so start time was before 8am & they finished by lunchtime (after which there was a buffet lunch provided in the hotel). The quality of presentations was very varied & the topics covered were so vast that I elected to only attend on one day after seeing the program. It was a pretty expensive morning for my Euro 350! Imagine my delight to receive an email after returning home to say that I had been selected by the committee & given "Best Presentation Award". So I could go online & download my certificate. Nice! However, there was no information about other award winners on the conference page so I emailed WASET & was told that "The best paper presentation awards have been sent to the deserving delegates by email". So I asked how many awards there were & the response was "Sorry! We do not provide the requestedinformation." I strongly suspect that many if not all participants received the same award. A search online found someone who got an award at another meeting. Of course, it's a good ruse - people are more likely to advertise the conferences if they can say they won an award. Call me a cynic but I will be avoiding these "conferences" in the future. Well being new to research I fell for the WASET scam. Currently in Singapore a 14 hour flight from the UK delivered my 5 minute slot yesterday. What a joke, one pokey room in a hotel with topics that have no relevance to the conference title. Presenters not bothering to turn up and no key note speakers. Essentially it was just a room in which you did your 5 minute slot to say you did it and then not bother to turn up to listen to others as they have no connection with your topic. I agree: do not attend at all. I've been to a conference in Tokyo in September 2017. The first talk was about sexism in the choise of music instruments in the musics of Japanese anime (or something like that), and I thought 'damn, I'm in the wrong room!'. Nope. They have something like 10-20 'conferences' during the same days in the same place, and then you find out that they are all together in the same room. Now, if I type 'Waset Kyoto 2017 on Google I find one conference on urban design, one on sport science, one on organ printing, one on turism marketing, and so on. As result, you won't understand one word of the 99% of presentation you'll see, and, even worse, the 99% of the audience won't understand one word of what you'll present. Hi, I am having the same, exact problem. I just submitted my paper, but never signed the form for publication, I never registered in the conference, but now I found that my paper has been published without my permission. Same here. Submitted a case report a few months ago to upcoming conference in Tokyo which will be held in March 2018. Didnt register or pay for the conference since I realized there is something wrong. Submitted the case report to a valid journal and now realized that they have already published the abstract under WASET online!! I could not withdraw since I didnt find a way to contact them. Since I only saw the abstract, not sure if they will publish the full paper but they don't have my consent to do any of the publishings. The valid journal has a rule that the manuscript should not have published elsewhere unless in the form of abstract. Not sure what to do now. Hi, I am having this exact problem with the WASET group. I did not register to attend the conference and never signed any copyright form with them. I even wrote to them officially to withdraw my papers but I am still finding these online. Even though they replied to tell me my papers had been withdrawn but I still fine the abstracts online. I still do not know why legal actions to take. I am in same position as you. Thank you for your reply. If my paper is showing online, can I send it to any other repute conference, since I never give presentation, nor I gave any copyright to WASET. Well I do not have an idea of how to go about that. As it still can be viewed online. I advice that you email the WASET via their website (exactly why I did). With their email reply, you can now decide to present or submit to another conference or seek some legal actions. But the email correspondence will serve as a proof of your claims. I am the latest victim of these people. I found out about a conference in my field on a credit webpage in my field, and decided to submit a paper and register. Initially, there was nothing to suspect: they made some comments for change on my paper, although nothing major, I didn't expect much with "so-called peer-review" conference paper (probably except Min Eng conf). The registration with credit card went through smoothly. Although I found out that the papers are a bit more varied in themes compared to other professional conferences, they are still somehow related to the my field. Everything seemed legit. Not until 2 days ago I asked them for final conference program and found out that the papers are in such vast areas of research, no keynote speeches, no reputable researchers there. Maybe other people withdrawn their papers. Then I became suspect and I found out about this blog spot. I wished I was more cautious about this conference, but I'm new to the academic world and I didn't know this type of "scam" does exist. I know I'm stuck now. But should I still attend the conference which is happening in 2 days? Should I still present my work? I don't want anything to do with these people anymore. What a lesson. So sorry about that. Did you eventually attend the conference?How was it? A big big big thanks for posting your experiences. I am a stundent and was about to register for WASTE conference in area of Ecological Architecture. I had no idea how conferences work and the system of international research publications. I checked the proposals selected by them and all of them were too vague and random to be able to fit in the topic. Thankfully I took time to search about this before I register. Thank you alot for saving me and many others like me who are newbies here. My name is used as a scientific committee member in many of their conferences. They never communicate to me to become a scientific committee member but put my name without my consent. I do not see any contact email I can use to communicate with them. I dont know, why the international legal system is so weak that anyone can misuse others credibility and there is no way to control it.!!?? My name (Preyesh Stephen) is listed in their conference scientific committee (one eg. https://waset.org/conference/2018/05/rome/ICHPTRD/committees) and I never even see any of their conference material/manuscripts. I never review them. So, you know what is their scientific review process and the quality. I just attended and presented at WASET's International Conference on Disaster and Emergency Management in Rome. I am feeling very foolish now that I have discovered this blog, but I had no idea it was a sham. I thought it was the most bizarre and poorly organized conference I have ever attended, and while a handful of presentations (actually three) were on the topic of disaster management, the others were in fields and areas that I as a Social Scientist knew nothing about. The conference was held in a far-flung hotel far from the center of Rome, presentations occurred in one room, and there were maybe 10 people in the "audience" for each session, and half of them were the presenters! I also was "awarded" a certificate for the best presentation at the conference, but later learned they gave out multiple copies of these to others at the conference. Thankfully, I only did an oral presentation, and did not submit a written article, but I still feel really stupid. Conference fee was 450 Euro and there was a lunch at the hotel and a couple of coffee breaks, but truthfully, the conference was so bad and the content so unrelated to anything I do, I left before lunch! I faced with the same feeling with you Matt, I wonder if we can do something with this. Since the conference has been continued. I don't want anyone to face with the same experience. I think that the owners of WASET must stop these "activities"
It has been pointed out to me today that I am apparently on the "International Scientific Committee" for a WASET conference on Nitrogen Fixation! https://waset.org/conference/2019/06/london/ICNF/committees. They really are an unbelievable bunch! How dare they use people's names in this way? I would like to share my experience attending the conference organized by WASET.org, it is the scam conference. I was so disappointed. 1) There were difference papers in different decipline, but they managed to organize in one conference. So all the participants were presented the papers which did not related to each other. We all received the certificates indicate the different conference name!! 2)They conference schedule was supposed to take place two days, but it was only one day for the conference. The organizer was disappeared on the 2nd day of the conference. There was one guy who organized everything including the registration, opening session, session chair ....closing seesion. I wonder if we can do something, I don't want anyone to face with such experience I had. The conference seems to continue organize in different countries.